On Friday, Sprint released a statement saying they will no longer be releasing a WiMax version of the Blackberry Playbook – RIM’s attempt to enter the explosive tablet marketplace. “We apologize for any inconvenience but the BlackBerry 4G PlayBook Tablet that was announced in January for summer availability will no longer be coming to the Sprint network,” Sprint said in a statement. Sprint currently offers a WiFi only version of the Blackberry Playbook which, if connection to Sprint’s Mifi, could actually access Sprint’s WiMax network, but that is certainly a round-about way to go about it. RIM, the maker of the Blackberry Playbook, said that instead, they will focus their development efforts on LTE, the 4G technology that is more widely adopted throughout the United States. “RIM has decided to prioritize and focus its 4G development resources on LTE,” it said in a statement. The operator currently offers a Wi-Fi-only version of the tablet. A customer could connect that device to a Wi-Fi hotspot that uses WiMax on the back end, such as the Mifi, and connect to Sprint’s WiMax network that way. RIM said it will focus on LTE, the 4G technology more widely adopted, instead of WiMax. “RIM has decided to prioritize and focus its 4G development resources on LTE,” it said in a statement. “Testing of BlackBerry 4G PlayBook models is already underway and we plan to enter labs for network certifications in the U.S. and other international markets this fall,” it said. RIM is using the Blackberry Playbook as a way to enter the tablet market space. However, there are some serious shortcomings with the Blackberry Playbook that is going to make it difficult to compete. First, the Blackberry Playbook does not have native apps to run on device. 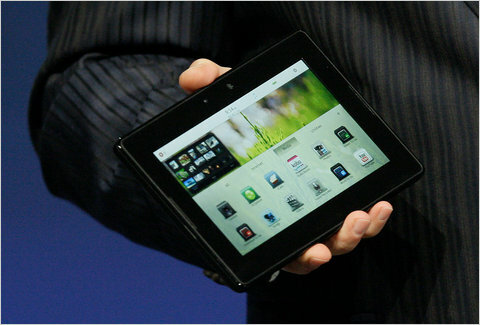 This means, users of the Playbook have to find other ways to access. Second, something as simple as checking your email on the Blackberry Playbook requires that you hook up your Blackberry mobile phone to the tablet, and then proceed to check your email – something that sounds painfully cumbersome.